Piquadro is a leather handbags, briefcases and small leather products brand from Italy. It also sells other fashion and apparel related goods, including watches and umbrellas. But the main business of the company are luxury leather travel goods and bags for men and women. The company was established by Marco Palmieri and soon after the opening of the first stores (the first shop under name of Piquadro was opened in via della Spiga (Milan)) the brand gained good reputation for leather artisanship, innovative methods and high quality products. The company has also patented many of their techniques. Today if you want to purchase their products, they are accessible via their own internet store or at 1500 points of sale all over the globe from Barcelona to Hong Kong and Moscow. This company is also included in the Borsa Italiana. The brand is doing quite well in the current economic situation - the turnover in 2010 was estimated 52 million euro. 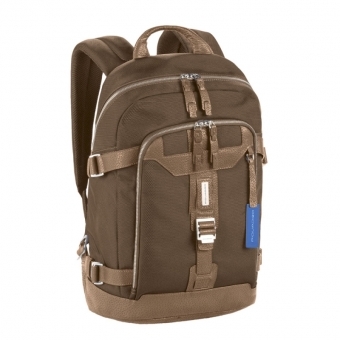 It is a very ergonomic and comfortable backpack that can also house a laptop. Its size in cm is 25 x 40 x 14. In inches it is 9.8" x 15.7" x 5.5". It is made in very durable fabric with natural look tanned leather trims. The textile material used is long lasting, easy to maintain and clean. This bag is provided in a sufficient color palette - you can purchase the particular backpack model in orange, blue, red, black, brown, grey shade. Price for the backpack is 182 EUR (250 USD). Or if you need a briefcase, this brand has many models that have very trendy and masculine designs and great price combination. For the price of 314 EUR (USD 430) you can get the briefcase (photo to the right). It is definitely a competitor to similar briefcases from fashion brands with big names, such as Gucci or Armani, but this case is costing an affordable price and offers equal quality and design. This bag is 43 cm x 30.5 cm x 13 cm large. 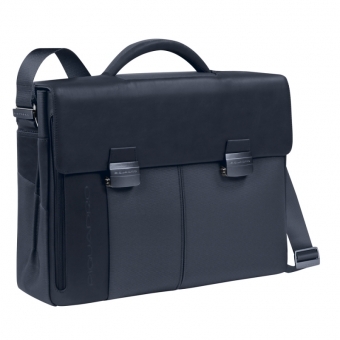 It has two separate compartments and a padded compartment for 15" laptop. The material is durable fabric and leather. There are credit card place and place for pens. It is available for purchase online.